More non-Zodiac stuff from the new trial deck! Time Leap – AUTO [R]: [SB1, choose 1 card from your hand, and discard it] At the end of the battle this unit boosted the vanguard, you may pay the cost. If you do, time leap this unit. AUTO GB1: [CB1] When this unit is placed on R from the bind zone, you may pay the cost. If you do, draw 1 card. 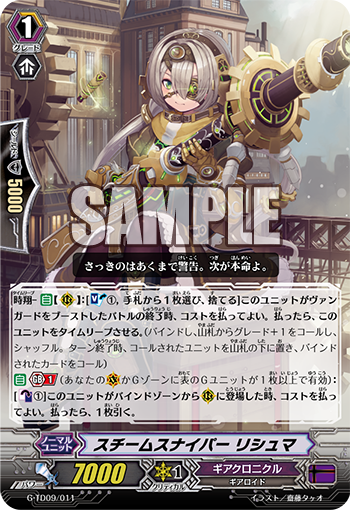 Today we’re introducing “Steam Sniper, Lishma”, included in Trial Deck “True Zodiac Time Beasts”! “True Zodiac Time Beasts” includes the 12 Zodiac Time Beasts who appear in the animated series, as well as Units that support their strategy. “Lishimia” is a Grade 1 Unit that strengthens the 【Time Leap】 tactics of the 12 Zodiac Time Beasts! At the end of a battle in which it Boosts your Vanguard, it can Time Leap itself to Call a Grade 2 Unit! Since it has no restrictions such as Generation Break 1, meaning it can easily allow you to aim for multiple attacks early one. Of course this costs 1 card from your hand, but it’s ideal for when you want to aggressively aim for swift attacks! And once you’ve achieved Generation Break 1, when your turn ends, when this card is Called from the Bind Zone, you get to draw 1 card, basically undoing the cost. And since you don’t need to have the attack hit, giving her a very good charm of being able to play a key role both early on and during the second half. Of course she’s not limited to 〈Zodiac Time Beast〉 Decks, but she can play a major role in any Deck that uses 【Time Leap】. If you enjoy the idea of being aggressive in your attacks from the very start, this is the card for you to try!